All dog owners know that one of the best parts of having a furry friend is that they can join you on many outdoor activities. Cycling is no exception. There is a wide variety of pet bicycle carriers to choose from, whether your dog is small or large, or more active than others. Attaching a duffel-style bag or basket to your handlebars will give your pooch the impression that he's in a cocoon-type bed as he coasts along and peers outside of the top, enjoying the ride with you. This option is best suited for smaller dogs under 15 pounds. The Snoozer Sporty Bike Basket is just under $60. With the look of a plush doggie playpen, what pup wouldn't want to ride along in this basket? 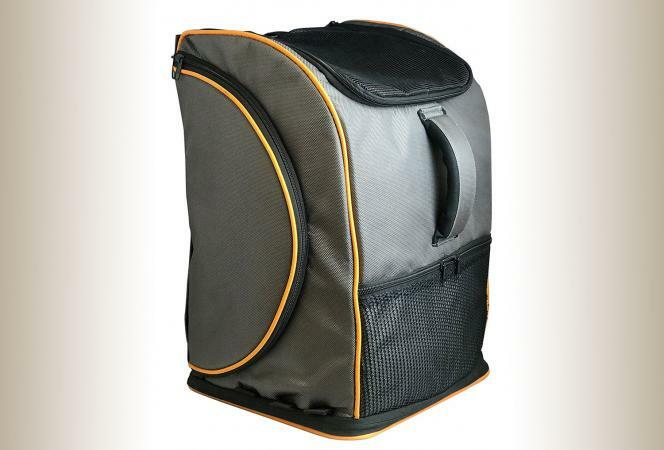 This carrier attaches to, and sits on, your bike's handlebars, allowing you to keep an eye on your furry friend. It also comes complete with multiple storage pockets and a mesh rain cover. As an added bonus, it has a mesh water bottle storage pocket to keep both you and your pup hydrated on long rides. According to Best Dog Crates and Beds, the basket is durable, great looking, and easy to clean. The Solvit Tagalong Wicker Bicycle Basket is just under $90. If your dog is sometimes hesitant to leave home but ultimately enjoys the adventure, this basket resembling a bed might be just the ticket. 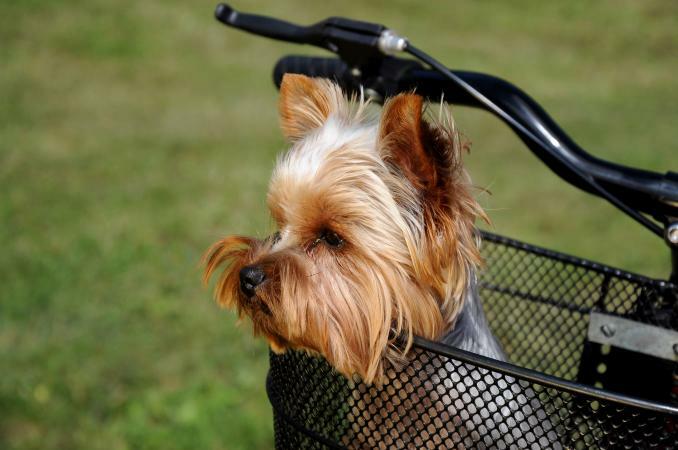 What makes this bike basket unique is its adjustable safety leash, which has an easily attachable bracketing system that allows your bike's brake cables to steer clear of the basket and keep your pup safe. This basket also features a cozy faux-sheepskin liner. 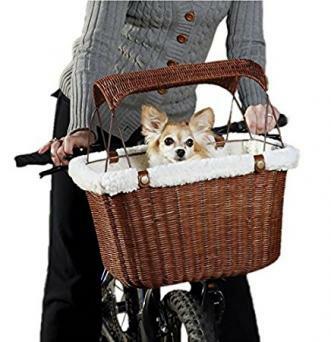 Best for small dogs up to 13 pounds, this basket easily attaches to any bicycle's handlebars and even has a wicker roof to protect your pup from the elements. The DoggyRide Cocoon Bike Basket/Carrier runs for under $120. As the name suggests, this "cocoon" will keep your dog nice and cozy while sitting on your bicycle's handlebars. Resembling a small duffel, this bag can also serve as a travel pet carrier or pet car seat. TopDogTips.com ranked this multipurpose carrier as one of its Top 5 dog baskets of 2017. Suitable for dogs up to 15 pounds, this basket also comes with a mesh dome cover and rain cover to keep your pet clean and dry in all types of weather. While this option isn't necessarily a "carrier," it's a great option for those looking to give their dogs a bit of exercise while you get your sweat on, too. Tow leashes also work well for larger dogs. One thing to keep in mind with this type of leash attachment is your dog's strength and prey instincts. Does he tend to walk you rather than the other way around, or take off running at the sight of a squirrel? While these characteristics shouldn't make you rule out a tow leash, be mindful when choosing the quality and design. You definitely don't want to just go with your regular standard dog leash, as it can cause your bike to tip over when your dog pulls sideways. The Bike Tow Leash is safe, stable and fun. What separates it from other products is that it automatically communicates direction commands to your dog by pulling to the side of its neck and allowing you to stay upright with just a single finger. The leash can easily be installed on any single-speed and internally geared bikes with the universal mounting clamp. The clamp is included and can be mounted on either the right or left side of your bike. If you have a faster dog and your bike lacks a large front sprocket shift, the website offers other mounting accessories you can purchase separately. It retails for under $150. The Petego Cycleash costs just under $50. This more affordable option is suited for all types of cyclists, from casual to competitive riders, and is lightweight and ergonomically designed. Its bungee cord design is great for active dogs of all breeds and sizes, and allows you to stay steady while your dog maintains a safe distance. Reviewers praise the leash, noting that it works great for larger breed dogs and helps keep the dog at a safe space from the bike. Drymate's Woof Cycle Dog Bike Trotter retails for just under $35 and is another great option that allows your active dog to trot alongside you and also get some exercise. The trotter's bike attachment connects to your back tire axle, where you tighten it until secure. Although it is easily removed with the quick connect pin, the attachment can safely remain on the bike when the trotter is not in use, making it a great option for riders looking to save time when they can. 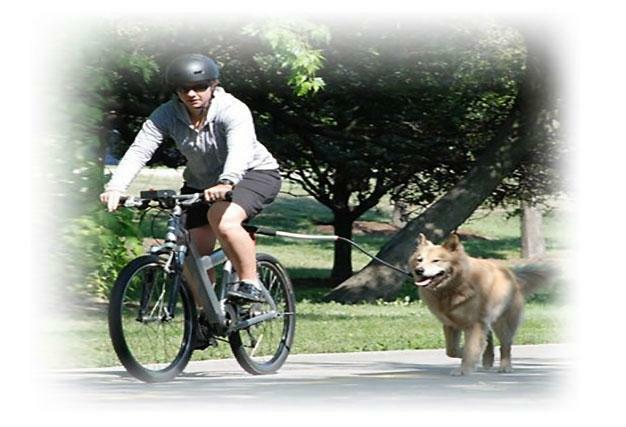 Reviewers praise how easy it is to attach and say it does a good job keeping your dog away from the bike, but still within a safe distance. This type of dog carrier is best suited for medium-sized dogs that are about 50 pounds in size. They are easy to assemble and attach to nearly any type of bike. Many are even waterproof and designed to protect your pet should it start raining mid-ride. Any low-maintenance dog will love hanging in the back and feeling the breeze hit their face as they relax and take in the ride. The Aosom Elite Pet Bike Carrier/Trailer retails for just under $100. As the name indicates, it attaches to the rear wheel of your bike just like a car trailer, and folds easily for simple storage and transportation. It also offers rear and front entry, as well as mesh windows and a leash attachment to provide a comfortable experience for your pet. This carrier can support dogs up to 30 pounds in size, of all energy and activity levels and life stages. Best of Biker's review notes its ease of use with front and rear doors, easy assembly and versatility in case of bad weather. The Comfy Pet Bike Trailer definitely gives you the most bang for your buck, as it can convert from a bike trailer to a pet jogging stroller. 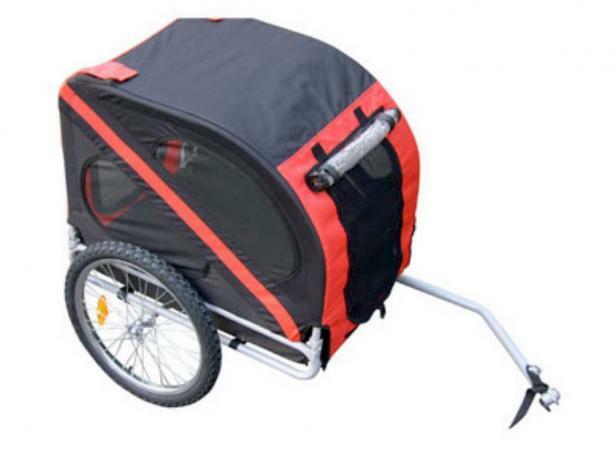 This collapsible carrier can seat dogs up to 55 pounds in size and is easy to assemble, allowing you to simply remove the front wheel when you're wanting to use it with the bike rather than a walk or run. It also has a zipper sun roof, so you can give your pet an al fresco ride when weather permits. Reviewers give it five out of five stars praising how sturdy it is and noting that it is easy to assemble. It retails for just under $40. The Rage Powersports Carrier is another convertible bike carrier/jogging stroller hybrid. What sets this carrier apart is that it's larger in size which makes it more versatile for larger dogs. It can fit a dog of up to 130-pounds when used as a trailer, and up to 85 pounds when used as a stroller. Its large rear and front wheels make it easy to navigate terrain from sidewalks to pebble trails and small grassy areas. It is a great way to bring pets along on a biking trip or a nice leisurely stroll without having to use a leash or worry about straying pets. It's also a great option if your pet's mobility is limited. It retails for just under $180. If you and your dog love to snuggle, this carrier is definitely for you. Your pup will feel free and secure on your back, enjoying the fresh air and lovely views. This type of dog carrier is definitely suited for smaller dogs under 30 pounds (for the owner's back protection). The K9 Sport Sack is fun and comfortable for both dog and owner. This versatile carrier works great not only for biking but for motorcycles, hiking and walking as well. Recommended for dogs 30 pounds and under, this carrier is ergonomically designed and also offers a rest pad at the bottom of the bag for extra support for your dog. Designed with safety in mind, this adjustable bag's D-ring hook-up will prevent your dog from jumping or falling out. A review on TopDogTips.com notes that the backpack is lightweight, waterproof and easily rolls up to fit inside a hiking pack. It retails for under $75. Ruffit Dog Carrier's original designs and durable protective material allow your dog to rest securely and comfortably in transit by using seatbelt-type restraints. Although this front-facing adjustable bag comes in four sizes (small to extra large), it is recommended for dogs 25 pounds and under. The bag has padded shoulder straps to provide optimal comfort for you. According to a review on TheGadgetFlow this backpack is great for hiking, biking and travel as it keeps your dog secure and close to your body. The Dog Carrying Backpack uses multiple adjustable straps to keep your pooch locked in and comfortable. It retails for around $100. With a similar zip-close design to the hitchback carriers, your pup will jump at the sight of the Luxury Lambo Pet Carrier Backpack. What sets it apart is that it's airline-approved, allowing you and your pup to board your flight without trouble. If you're a frequent flyer as well as a bicycle enthusiast, this is a handy gadget that will do double-duty for you and your dog. It's best suited for smaller dogs, and is also waterproof and serves as a portable kennel. It retails for around $60. With the wide variety of carrier options out there, it's important to make sure you're choosing the right type for your pup. When purchasing in person, visit the store with your bike in tow to make sure it's compatible with the carrier you have in mind. Call ahead to see if you can even bring your dog with you to try it out and see if he or she will ride comfortably. Weigh your dog before going shopping to ensure he or she will ultimately fit in the carrier you settle on. Consider your travel and storage needs, looking for extra pockets and convertible carriers. While shopping, look for carriers lined with soft, comfortable material. The more comfortable your pet, the more likely he or she will stay still and not fidget mid-ride. Talk to a sales associate about the type of terrain you mostly ride on, as this will help her make the best recommendation for your bike and surroundings. Choosing a bicycle carrier might seem like a daunting task with several factors to consider. However, you can be sure you and your pup will have a safe and comfortable ride if you take the time to select the right one.